TAPA Room 210: If a chicken can do public speaking, you can too! 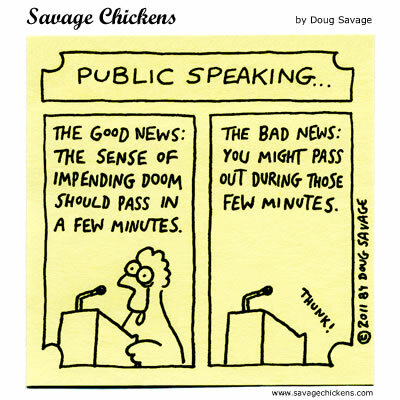 If a chicken can do public speaking, you can too! In my first semester of teaching Communications Class, I had six (6) students. In my second semester of teaching Communications Class, I had six (6) students. In my third semester of teaching Communications Class, I am beginning the class with twenty-one (21) students. Wow. I won't lie to you: it's a difficult thing to learn how to do, but if you can do it, it'll change your life! And hey, if chickens can, you should have no problem!